In 2011 the BBC and the British Museum collaborated on an audio series called A History of the World in 100 objects. The series, presented by Neil MacGregor, explored world history from two million years ago to the present through the stories of 100 objects from the British Museum’s collection. You can still explore the exhibition, listen to the podcasts, order the book and (probably) buy the t-shirt on the British Museum website. One of the most thought-provoking elements of the series is the insight into the lives of individuals and communities that can be drawn from a simple everyday object. It’s this idea that has inspired this post – the first in a series in which I’ll explore the history of Clarendon Park and it’s people through examining an object from the area’s past. I can’t promise I’ll make it up to 100 objects, but who knows. Bear with me, and as long as you’re not in any hurry, I’ll see what I can do. Today’s object is a promotional flyer promoting a concert held at Clarendon Park Methodist Church (now better know as Christchurch) on Clarendon Park Road on 24 October 1945. This was just a few months after the end of the Second World War and the very day that the United Nations was founded in an attempt to prevent a repeat of the conflict which took the lives of 3% of the global population. Every household in Leicester was touched by the war, and everyone who attended the concert would have had their own private story of tragedy, grief and survival. There must have been a powerful feeling of community as the little crowd gathered together to enjoy some classical music and song on that historic Wednesday. 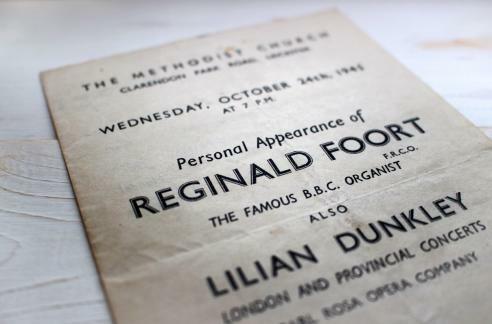 The headline act, Reginald Foort, was a bonafide national celebrity in the 1940s, and was well-known for his high-profile BBC performances. There are several videos online of him demonstrating his mastery over his intimidating instrument. The one below is from 1939 and is fabulously titled ‘Reginald Foort with his new wonder organ’. Reginald opened the evening with his self-penned signature tune ‘Keep Smiling’, followed by a selection of classical tunes. In between his pieces, the audience were entertained by a singer who would have been familiar to many to many of them; local soprano Lilian Dunkley. After joining Leicester Amateurs in 1921 as a 16-year-old chorus girl, Lilian embarked on a professional stage career in the 1930s. When the war started she was exempted from service so that she could continue singing to boost the morale of those on the home front. 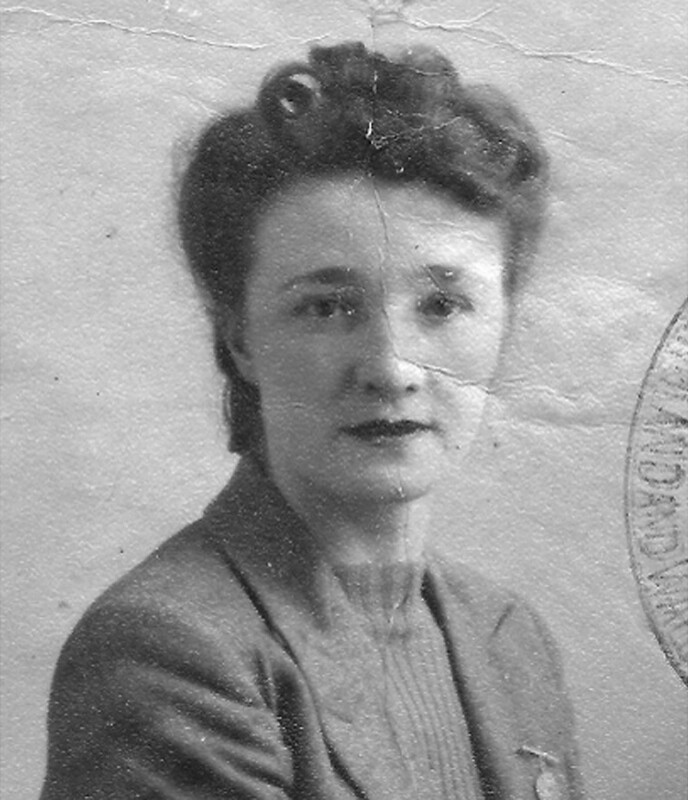 As well as touring local workplaces like Corah hosiery factory, she performed at war depots across Leicestershire and beyond. Moving on from the entertainers involved in the production, the logistical information on the flyer tells its own story. The subtly art deco font, the price of the programme at two shillings and sixpence, the directions on reaching the venue by tram and the finale of ‘God save the King’. All of these combine to fire the imagination and make what is barely more than a scrap of yellowed paper an intriguing window into the past. Soon after performing at the concert on Clarendon Park Road, Lilian became a singing teacher and she went on to run the Leicester Operatic Ensemble. She continued to be involved in Leicestershire’s classical music scene for many years and remains an inspiration to fellow performers following her death in 1997 aged 91. There are a number of operatic and orchestral groups in Leicester following in Lilian’s footsteps. One of them, the Clarendon Park Orchestra, meets every other week at Christchurch and performs regular concerts there. It’s good to see that, 70 years on, local performers are still helping the people of Clarendon Park to keep smiling. I took over from Lillian Dunkley as Producer of Newark Operatic Society. I was 21 years of age at the time, and from your Note about her, I realise she was, 71 years of age. She was not best pleased and took an irrational dislike of me – blaming me and regarding me as usurping her, which of course was utter nonsense. I am now 61 years of age and even now, I am much amused by the drama she caused about the matter. Of course, to her, I must have seemed like a mere child. Thank you for sharing this lovely memory Jonathan. It does sound quite amusing, although I imagine it must have been quite stressful for you at the time!